Unless you are wiling to put up a fight you will be neglected by our health system, the sister of a man who was paralysed in a freak gym accident has claimed. 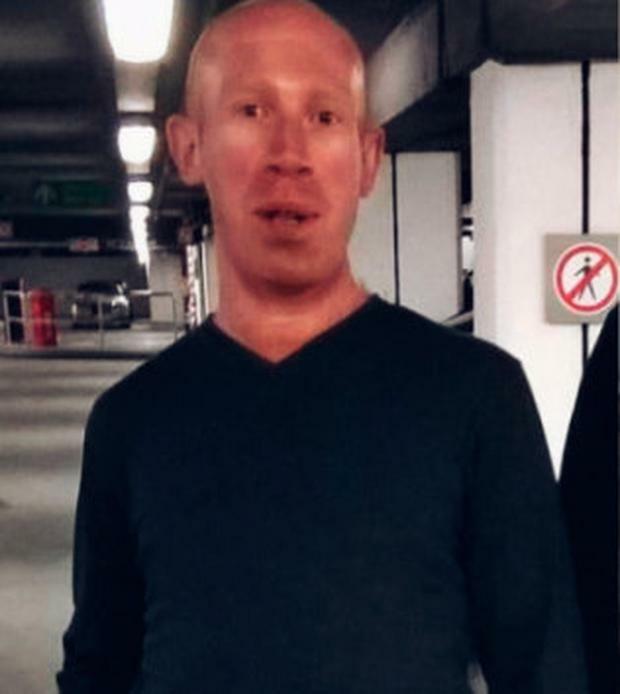 Andrew O'Malley (32) was a fitness enthusiast who dreamed of becoming a professional bodybuilder when he suffered a devastating injury following an accident in a gym in Sligo on December 1 2016. Andrew can now only move his head, neck and shoulders, he needs a tracheotomy and requires 24 hour care. 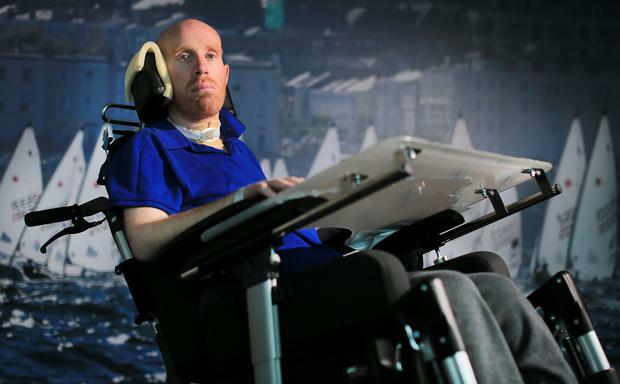 He has been in the National Rehabilitation Hospital (NHR) in Dun Laoghaire, South County Dublin since last June and his family are worried about what is next for him as they say the HSE aren't giving them suitable options. His devoted sister Emma McCabe, who lives in Ballivor, Co Meath, told Independent.ie that she feels the current healthcare system is not focused on helping patients recover as much as possible. Ms McCabe explained: "Andrew is very lucky that he has family around him to fight on his behalf but I'm sure there are people out there who wouldn't have that, God knows what would happen to them. "If it wasn't for us Andrew would probably already be back in an ICU bed in Sligo General Hospital. "It's crazy the way the system is set up, without a fight you will be neglected." She continued to say that her family would not have coped as well as they did throughout their ordeal without the help and support or Spinal Injuries Ireland. Emma praised them, saying: "I first contacted Spinal Injuries Ireland (SII) when Ireland was still in the Mater Hospital, at the time I didn't even know why I was contacting them but they have been phenomenal. "It was great to speak to people with experience in this area to see where we would go from there, they've visited Andrew and are a fantastic support to both him and our family. "As well as emotional support they are great for advice on the services and supports he is entitled to, I wouldn't have had a clue about any of this before. "I couldn't say enough good things about SII, without them there really is nothing else available to people in our position." She added: "I don't think I would have been as hopeful about Andrew's future without them, I would have felt there were no supports and nothing out there. "They really have given us hope." Earlier this week, Emma explained the heartbreaking story of how Andrew's life was turned upside down. She explained: "Before the accident he was very healthy and loved fitness, ironically in the few years leading up to the accident he loved the gym and it became a real passion of his. "Andrew was in the gym that day, like he was every day, he was doing a warm up on the squat machine and he was leaving the weights back when he slipped and some of the weights fell on top of him. "He doesn't remember anything after that, we know an ambulance was called and he was brought to Sligo Hospital, mum and dad were called. 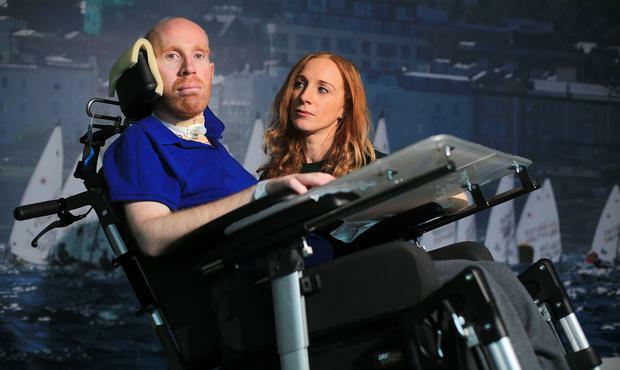 "They were reassured at first that he had hurt his back but that things were going to be grand, within the next few hours it was mentioned that he would have to be transferred to the Mater Hospital, it was only then that we started to realise that things were serious. "Up until this point we were told that he would probably need to be in a wheelchair for a while and that he would need physio but that he would be grand." It was when they went to Dublin's Mater Hospital that they discovered the extent of Andrew's life-changing injuries. Emma recalled: "We were called into the family room and we were told that he had broken his C3 bone at the base of his neck and completely severed his spinal cord. "We were told that he was fully ventilated, he may never be able to breathe again independently or regain his speech (Andrew has since regained his ability to talk and was gradually weaned off a ventilator). "There are no words for what it was like to think of that happening to our Andrew, the baby of the family, so fit and healthy. "He is such a loving person, tactile person and he just loves life and loves people. "The thing I miss most are his hugs and we knew that we had lost that part of Andrew but he is still so positive, he's still 100 per cent himself mentally and believes he can live a full life and is excited for the future but he is frustrated about where he is." After six months in the Mater Hospital, he was moved to the NRH last June, initially he was only supposed to be there until last September, no other plan has been put into place and Emma fears time is running out as other patients will need the bed. Emma, who is originally from Mohill in Co Leitrim, said: "His option at one stage was a nursing home but every nursing home has said that they don't have the facilities required for his level of care. "We know there must be better options than him being in an Intensive Care Unit for the rest of his life, people ask us what we would like ideally but we don't know because nobody is telling us what options are available for him. "We would like for him to be in independent living, like Cheshire Apartments, where people with disabilities have their own apartments and medical staff live on-site, but we have been told that Andrew's needs would be too severe for that, home care also isn't an option for us. "An ideal just doesn't seem to exist for him but we're trying to find what is the closest we could get to that." She also said that the limited amount of physiotherapy Andrew is receiving every week is taking a toll on his well-being. "He started of with six hours a week of physio when he was first admitted, once his planned release date in September came he was put down to an hour and a half of physio a week. "His muscle wastage is huge because he is literally not using the muscles and that's impacting on his general physical health. "It's also having a huge impact on his mental wellbeing, physio is the closest thing to the gym and his old life that there is, plus he also gets on really well with the physios in the NRH, who are all fantastic. "But an hour and a half a week is cruel, it's hard to wrap your head around, we cannot wait for him to leave hospital for that to increase, that needs to happen now, for both his physical and mental well-being," Emma said. While inspirational Andrew is staying upbeat about the situation, Emma said she fears for what his future holds. She said candidly: "Andrew is pulling us through this, it should be the other way around but he is determined that he has a future and is determined. "My eyes are now open to the failings of the HSE and until I see a firm decision has been made by them, it's hard to be excited about Andrew's future. "It really is so frustrating, Andrew is so positive and he is ready to move on with his life, I am concerned that he has stayed positive for so long but how much strength can anyone in his situation have? "He needs to know for certain what's going to happen, where is he going to go and will it be the best option for him? 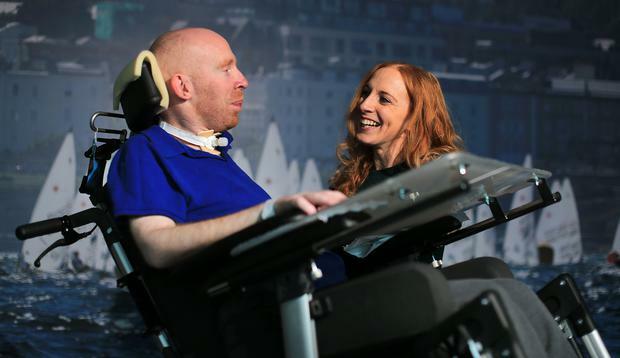 "He wants to start living again, rather than just lying in a hospital bed." Andrew's dedicated family know that whatever his long-term care is it will be extremely expensive, so they have set up a GoFundMe page to help cover the costs. She said: "It's hard to know what exactly the GoFundMe donations will be used for but we know that whatever long-term care he ends up in, his living expenses will be so high. "He'll need environmental controls for things like opening the curtains, turning on the lights, controlling the heating - things to make him more independent are really expensive." In just 24 days the generous public has donated almost €19,000 and Emma says her family is blown away by the support. She said: "The last 15 months have been so dark, with no hope, and now thanks to the page we are getting so much support, it's so heartwarming. "People have been getting in contact who we wouldn't have heard from in years, they are coming out of the woodwork to give as much as they can, not just financially but also emotionally. "It's the first bit of a silver lining we have seen in all of this, a bit of positive in all this gloom." A HSE spokeswoman told Independent.ie that they are assessing Andrew's case. She said in a statement: "I can confirm that a referral was received from the NRH for a residential service for Mr O’Malley. "To date the application for Fair Deal Nursing Home funding has been approved, however, due to his considerable care needs the only service locations available to accept him requires a nursing home ‘top up’ payment. "The business case has been completed which identifies two service options which are being considered. "In addition, Mr O'Malley requires a motorised wheelchair. The NRH have recently provided the specifications for the chair and the HSE is currently progressing the purchase of same." Conor Feehan A lack of refrigeration facilities and cramped conditions has led to a situation where bodies of the deceased are being placed on hospital trolleys and are decomposing. Eilish O'Regan An anti-HIV tablet will be offered to at-risk groups later this year after an independent review found it safe and highly effective.